To investigate the rate of acceleration of falling objects, Gallileo Galilei was reported to have used a water clock to measure time. In this video, we experiment with a water clock and examine the results to identify limitations of its design. The reservoir was constructed by filling a 50mL burette with water that had been dyed blue with food colouring for the purposes of visibility for the camera. This burette was set in place with a clamp and retort stand. Upon the retort stand base, a mass balance was placed and 100mL conical flask such that the water could be collected and weighed. The burette tap was opened for a period of 20 seconds at a time, this interval length was chosen to be as long as possible as to minimise human reaction time in opening/closing the tap but still achieve a sufficient number of 5 data points before becoming empty. Time was initially kept using a physical stopwatch, however it was soon decided that keeping time on an iPhone was far more responsive than having to depress a physical button, which in turn would reduce reaction time errors. At the end of each interval, the mass and volume displaced was recorded in a table such that if the mass balance proved to be unreliable, then the volume data could be used instead and converted to mass via density calculations. Time vs. Mass or Volume would then be plotted to identify whether the relationship between mass of water and time were directly proportional as its design assumes.The reservoir was constructed by filling a 50mL burette with water that had been dyed blue with food colouring for the purposes of visibility for the camera. This burette was set in place with a clamp and retort stand. Upon the retort stand base, a mass balance was placed and 100mL conical flask such that the water could be collected and weighed. At the end of each interval, the mass and volume displaced was recorded in a table such that if the mass balance proved to be unreliable, then the volume data could be used instead and converted to mass via density calculations. 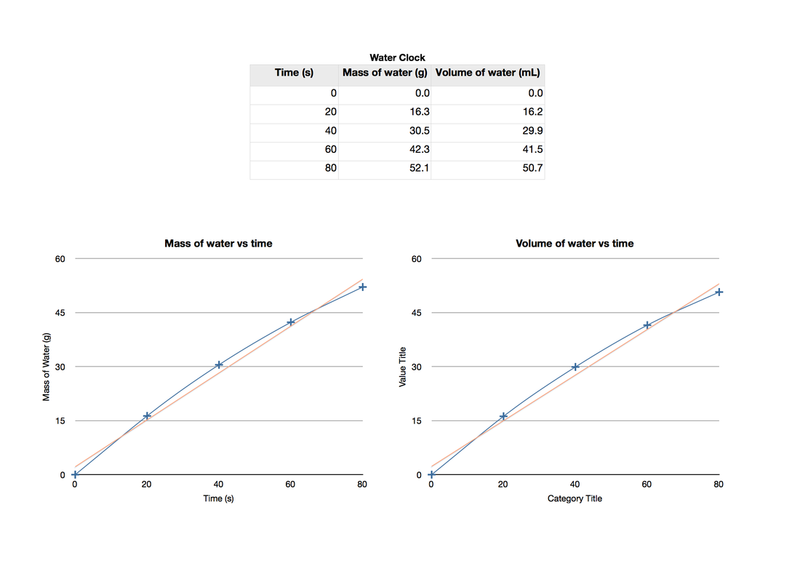 Time vs. Mass or Volume would then be plotted to identify whether the relationship between mass of water and time were directly proportional as its design assumes.